Gov. 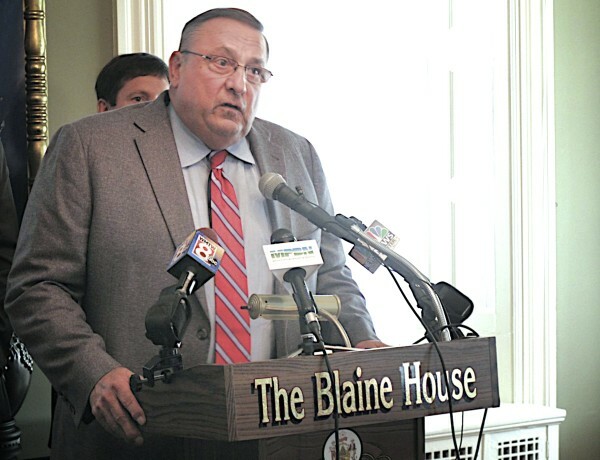 Paul LePage said Friday at the Blaine House that Democrats' opposition to his constitutional amendment to repeal the income tax is "despicable." He also pledged to veto every bill sponsored by a Democrat until his opposition relents and accepts his constitutional amendment to eliminate Maine’s income tax. Gov. Paul LePage’s recognition that state programs would have to be cut — and that he has to be specific about which programs — to make his desired reduction and eventual elimination of the state income tax possible is a welcome development. But his release this week of a list of potential cuts in the waning days of the Legislature as lawmakers scramble to finalize a state spending plan for the next two years is just the latest laughable episode in LePage’s income tax elimination saga that shows why the the governor’s income tax-slashing proposal was never realistic. The income, corporate and estate tax cuts the governor unveiled in January as part of his two-year state budget proposal included a recognition that, at least for the two years covered by his budget, tax cuts needed to be paid for. To that end, LePage proposed a sales tax increase and an expansion of that tax to services not currently taxed — two changes that would generate $560 million in new state revenue over the biennium. But LePage could never get his fellow Republicans on board with a sales tax increase. And even with those tax increases and the elimination of municipal revenue sharing, the governor’s plan left a hole in future state budgets that would grow larger as his proposed tax cuts fully phased in, posing a major structural problem for state government. Plus, LePage’s uncompromising attitude toward any lawmaker skeptical of his tax plan didn’t help its chances. Then, LePage’s pairing of his income tax reduction proposal with his quest for a constitutional amendment to eliminate the tax has only complicated matters. In March, LePage said, “I will spend the rest of my days going after those people,” referring to lawmakers opposed to his tax plan. Showing that the remark didn’t move the needle, Democratic and Republican legislative leaders both subsequently introduced alternative tax plans with smaller tax reductions. LePage has deployed an equally nasty — and equally ineffective — demeanor when it comes to his proposal for a constitutional amendment to eliminate the income tax by 2020. In a fiery press conference last Friday, LePage said he would veto every bill with a Democratic sponsor until lawmakers approve LD 1367, the constitutional amendment bill. This week, as legislative leaders have closed in on a budget compromise that doesn’t include income tax cuts, the LePage-allied group Maine People Before Politics launched robocalls targeting senators from both parties involved in the deal. The calls, recorded by LePage’s daughter, Lauren, accused Senate Republicans of “working behind the scenes with liberal Democrats” to oppose LePage’s tax reform proposal and supporting “taxpayer-funded welfare for illegal aliens” instead. Apparently, the threats aren’t working, since budget negotiations are delayed but not derailed. So, on Wednesday the governor’s office offered a long list of state programs and services that could be cut to make up for revenue losses that would come from tax cuts in the two-year budget that takes effect July 1. Most of the items on the list represent small budget savings, such as reducing staffing at state parks to save $164,500 a year and eliminating biologist positions at the Department of Inland Fisheries and Wildlife to save about $100,000 over two years. The big cuts would come from assistance programs, a favorite LePage target. Elimination of General Assistance could chop $24 million from the budget over two years. Elimination of Drugs for the Elderly would save another $23 million, and ending a state funded, long-term elderly care program would reduce spending by nearly $18 million. Even if such cuts were politically palatable, and many aren’t, it is much too late in the process to give due consideration to such major changes. Plus, if LePage came up with a list of savings totaling $133 million for two years, how could he — or any other politician — possibly come up with enough cuts to support the elimination of the income tax, which brings in about $1.5 billion a year? Responsible lawmakers from both parties have been right to marginalize LePage as they have conducted budget negotiations. That’s because LePage hasn’t been willing to work out a compromise and consider lawmakers equal partners. He shouldn’t insist on being included now.